how do you insert an image in the form? 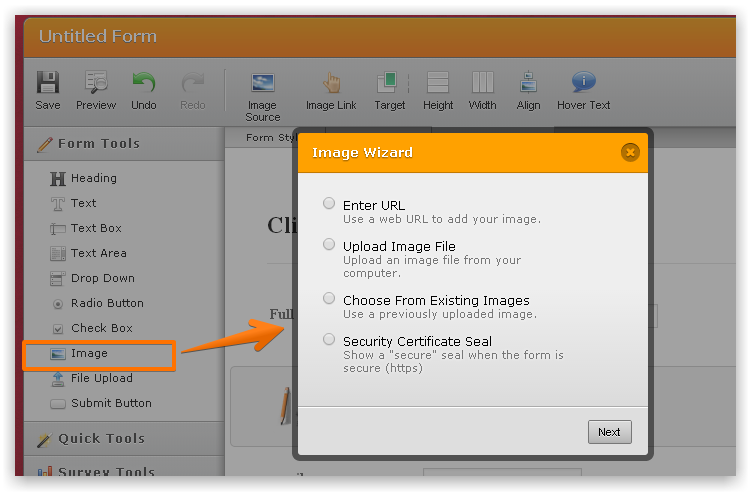 To insert an image to the form simply click on the Image tool that is found under the Form Tools tab. Then you choose how you wish to insert the image. Pleas inform us if you need further assistance. Did that, but the image does not show up in the form. Do I need to change browsers? Using Safari. Have you tried already clearing your browser cache and cookies? If not, can you please give a try? After that, you may try to add again your image into your form see if the issue still persists or not. I uploaded the image from browser. then went to selct from existing images. This is what I see on safari. If I click on one of them, I see the jotform logo image. Kindly check the screencast posted below, to verify the process. If possible, do provide the Form Title / URL to assist you better. Thank you.